The winner of this poetry contest spoke not a word. Oregon School for the Deaf student Tiffany Hinano Hill signed Diane Wakoski’s “Inside Out” today during the final round of the statewide Poetry Out Loud contest at the downtown Grand Theater. 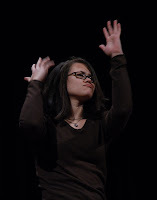 Hill beat 21 other contestants with her delicate yet vivid hand signals that created a visual portrayal of the Wakoski poem. An interpreter read the poem directly before her performance. It was a challenge for both Hill and for the judges, who for the first time had to factor in the element of deafness. West Salem High School junior Jackie Lubbers finished second. Salem Academy senior Katharine Hormann also advanced to the final round. Sprague junior Merry Borchers and Woodburn’s Brianna Eamons also represented the local area. Other contestants came from Bandon on the south coast to Central Oregon’s Crook County to northern high-desert Arlington. The Oregon Arts Commission hosted the event, which is a stepping stone to next month’s National Recitation Contest in Washington, D.C. As the statewide winner, Hill won a $200 scholarship, $500 for the OSD library and the honor of representing Oregon at the nationals April 26–28. The judges deliberated for more than 45 minutes after the final round today — much longer than expected. Event coordinator Deborah Vaughn said points were extremely close, but the decision was unanimous. Judge Jeff Wildenstein of Seattle, a sign language interpreter, said Hill’s performance showed the poem’s depth. “I can say with 100 percent certainty that she nailed it,” Wildenstein said. “It was beautiful to watch, but it also conveyed the meaning. “We were looking to see that the integrity of the poem was upheld in the interpretation,” he added. Wildenstein said he thinks Oregon is the first state to include a deaf person at such a poetry contest.